Well, sheesh! What a completely whirlwind couple of weeks. The kids tag teamed me and Duncan was home sick the first week, then when he went back, Angus was out for a week. A wee bit trying but, the rewards were so so sweet. Angus spent a lot of time with me in the la-BOR-a-tory, otherwise known as Mom-Mom’s Magic Sewing Room. The origin of the latter name is this: last Christmas Hubbalicious gave me the most beautiful couch you have ever seen. I mean this couch is so fantastic that it should really not be in the same house with small hollering boys. It is enormous and silk. So I wanted the children no where near it. I told Angus that it was Mom-Mom’s Magic Couch. I then proceeded, with a completely straight face, to tell him it was Magic only for Mom-Mom and that if anyone else touched it, they would SHRINK in their sleep. Growing big and strong like Daddy is a big priority around here, so the prospect of shrinking scared him away from the couch, seriously. In the year we have had it, not only has Angus not touched it, he warns visitors to not even go in the room where the couch is. I put a similar fear in him about the la-BOR-a-tory. So he never goes in without me and LOVES it when he gets to. He cried when he had to go back to school because, and I quote:”But, Mom-Mom, I reaaaaaaallllllly want to help you in your Magic Sewing Room”. Okay, how cool is that coming from an almost 5 year old boy? The real capper in the realm of sweet rewards was when Angus, the Polar Bear (of course as a knitter I have kids that don’t wear sweaters without lots of coaxing), looked up at me and said:”Will you make me a quilt please Mom-Mom? So we can cuddle under it with the kittens.” Sure, honey- I will make you a million quilts until my fingers bleed, because you are so stinking cute. And why not just take the keys to the car while you are at it. 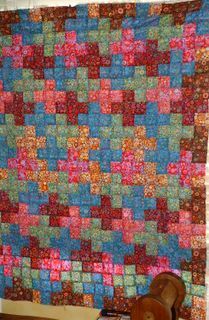 Here is the borderless top for the crosses quilt! 598 squares people! WoooHooo! And really this is my first quilt. I am pretty pleased. Now, to finish it! Ah, there’s the rub! Wow, amazing quilt! Just stopping by to say thanks for my Give a Little prize yarn which I received last week…Thanks! Gorgeous. Anybody who thinks “handcrafts” can’t be art doesn’t know what they are talking about. Your quilt is a prime example of an object transcending function.